Now and then, we get an influx of the same question on social media. The most common one we’ve received this month? : ‘’What’s the best Valentine’s gift for a man?’’. “I know Valentine’s Day has a cheesy reputation, but my wife and I always like to celebrate it. Some years we go all out with gifts and a posh meal out, while others we keep it simple by planning a cosy night in; but whatever happens, we always make time for each other. “As I’m one of the product merchandisers at Escentual I’m always seeing the new launches day in day out. There’s always something exciting launching every day here, which is why I think newness is the best and easiest gift idea. 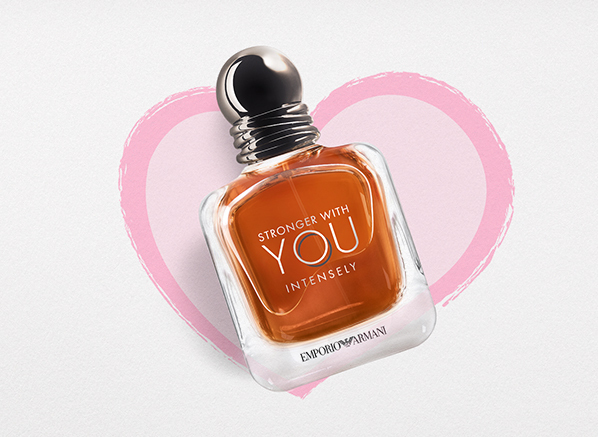 So many of our new launches are everywhere at moment too; take the just-released Emporio Armani Stronger With You Intensely fragrance, for example, its ad is on Instagram, on TV and in magazines, which means your other half is bound to have seen it or heard about it. Who knows they may already want it, I know I do – it’s warm oriental-woody scent is perfect for this time of year! “Cliches aren’t for me. My advice? Keep it classic. If your partner hasn’t asked for anything this Valentine’s Day, I recommend treating him to a fragrance that he’s currently running low on or already enjoys wearing every day – it’s a fail-safe way to please. This entry was posted on Friday, February 8th, 2019 at 7:09 pm and is filed under Fragrance, Hints & Tips, New products, Valentine's Day. You can follow any responses to this entry through the RSS 2.0 feed. You can skip to the end and leave a response. Pinging is currently not allowed.